Is Florida’s hurricane drought about to come to an end? One look at the upper ocean heat content for the western Atlantic Basin and you can see why I am concerned for the Bahamas and Florida over the coming days. The past few days have been very tedious in terms of tracking invest area 99L and what it may or may not do over the coming days. Unfortunately, tedious may be traded in for anxious and stressful from here on out as it looks like we could be facing a potential hurricane threat for late in the weekend. Before any concern arises for Florida, the system is first impacting portions of the northeast Caribbean islands with heavy rain and gusty winds. All of this mess will spread westward towards Puerto Rico and eastern Hispaniola later today through tomorrow. The potential for very heavy rain which could induce flooding is certainly there and needs to be considered as a serious threat. As I type this blog post, the Hurricane Hunters are about to head out in to the broad area of low pressure to determine what its status is. There is a chance we will have a tropical depression by later today but overall, I think the organizational process will continue to be slow and steady. The dry air we have heard so much about is likely going to be mixed out and the convective process will take over – meaning we will see sustained thunderstorm activity develop along with more curved banding. This indicates strengthening but also better internal structure which leads to even more strengthening. 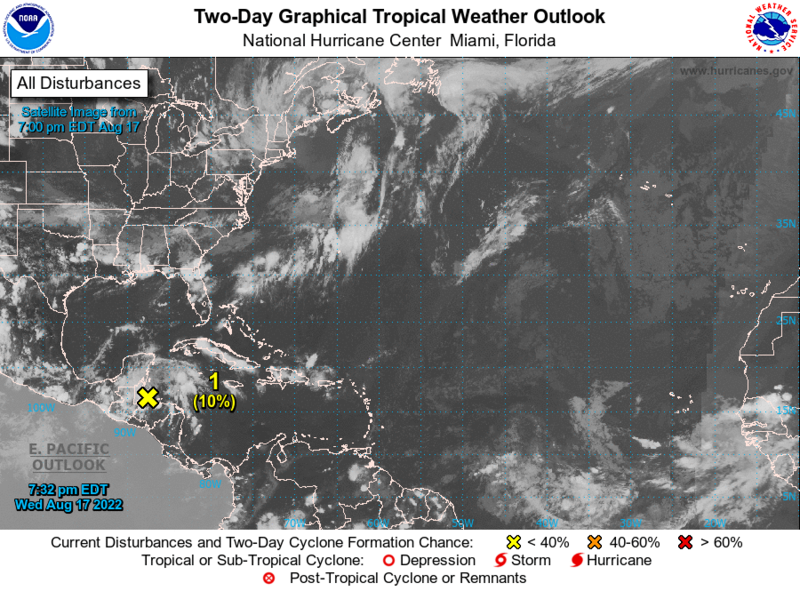 It is only a matter of time until we have a tropical storm to track and it looks to be headed towards the Bahamas as the week comes to an end. This brings me to the possible impacts to the Bahamas and Florida there after. Assuming the system goes on to develop as most of the modeling now indicates, it will be a matter of how strong it becomes as it moves west-northwest and then bends back to the west. This is VERY important as history shows us that when tropical cyclones (tropical storms and hurricanes) bend westward, south of a strong ridge of high pressure in the atmosphere, that they strengthen, usually quickly. It all has to do with lining everything up under almost ideal conditions. Many hurricanes have done this in the past and in the general vicinity that this system would be in over the weekend. As such, the potential is there for south Florida to experience a hurricane before all is said and done. How strong and exactly where is hard to say right now. Water temps are plenty warm and the models are suggesting a favorable environment for intensification. We need to watch this very closely – it’s been more than a decade since the last hurricane affected the state directly. Preparedness will be critical, especially if we see a period of rapid strengthening. I am putting the region on notice, you had best be ready! We have a few days to go still before we know enough to say for sure what will happen but by then, it could be too late to react properly and no one needs to be in panic mode. Use this time to make sure you have a plan in place and be able to enact it should the need arise this weekend. Unfortunately, the overnight models, namely the ECMWF or Euro, have come around to suggesting a track towards the west in to the southeast Gulf of Mexico early next week. This would give the would-be hurricane ample fuel and time to strengthen further. This is beyond the 5 day time frame so speculating on where it might end up is pointless right now. I know people want answers as soon as they can get them but it’s just too tough to make any definitive call at the moment. Needless to say, residents along the Gulf Coast from Texas to the Florida panhandle should stay on top of this and be ready in case it comes their way. We will have time to dissect the possibilities later on as more data comes in and the track and intensity becomes clearer. To give you an idea of how seriously I am taking this situation, I am making plans now to pack up my gear and head to south Florida as early as Friday morning. With the potential for a hurricane crossing the region, it warrants a field mission to the area. I will talk more about my plans for Florida and a potential Gulf Coast landfall in future blog posts. It’s been a while since a full-throttle hurricane took aim at the United States. While the jury is still out on just how strong 99L could become, I am not leaving anything to chance. The technological firepower that I have in my possession is stunning. So much has changed since a decade ago and even the past five years. I’ll keep you posted on my plans and what kind of information to expect as I travel south for what could be a break in the streak of no hurricanes for Florida. As they say, stay tuned but let me add, be ready! Even if this does not pan out, it’s still very much hurricane season and we have a long way to go. Luck favors the prepared – always. The NHC began issuing advisories on TS Erika late last night. At first, it looked as though the 5th named storm of the season would not intensify to hurricane strength – that changed over night. Warm sea surface temps, higher upper ocean heat content and a fairly favorable environment are now part of the new forecast which calls for the storm to reach category one strength by day four. It is worth noting that the NHC mentions having “lower confidence than usual” in the four and five day forecast for both intensity and track. This is due to quite a spread in the models. Some are showing a strong hurricane, others nothing at all really, just an open wave of low pressure. I tend to think that once clear of the deep tropics and the shear zone that destroyed Danny, that Erika will have a clear shot at becoming a hurricane near the Bahamas. The track forecast is fairly straight forward for the time being. A strong ridge of high pressure to the north of the storm will continue to force it on a fast-paced westerly to west-northwesterly course. This could place the northeast Caribbean at risk for some impacts as Erika moves closer. As such, tropical storms watches are up for a portion of the region. Perhaps we can at least get some rain from the outer bands and still have Erika pass comfortably north of the islands. We shall see, they certainly need the rain down that way. A lot will be made in the coming days of the track aiming at the Southeast United States and Florida in particular. It has been a long time since Florida had a hurricane threat of any kind, much less a landfall. Remember that five day track forecast errors can be large, sometimes hundreds of miles. There will be plenty of time to monitor the progress of Erika and rest assured, NOAA and other government agencies will be conducting a plethora of field recon in and around the storm over the next several days to provide state-of-the-art intel on what’s going on with the storm. This data will help to initialize the computer models each day, providing even better guidance. Just don’t let the cone of uncertainty become the cone of unnecessary anxiety. I will have a full in-depth video blog posted by later this afternoon once the morning model runs are complete. I’ll post it here as well as on our social media feeds and in our app, Hurricane Impact. I think you’ll find the discussion to be very helpful as I break down the major factors that are likely to be in play as we track Erika over the next several days. I’ll also have a separate blog post later today or this evening as I look back 10 years in to the past and our hurricane Katrina story, part of my “Seven days in August” blog series.